From social inequality to the epistemological challenge of quantum mechanics: Over 700 representatives of analytic philosophy will gather at LMU. “Many philosophers deal with currently relevant issues,” says Stephan Hartmann, Professor of philosophy of science at LMU, the organizer of the congress. Philosophers dedicate themselves to pressing social questions: these include social inequality as well as the significance of diversity for social decision-making processes and the credibility of climate simulations. Analytic philosophy has addressed an incredible variety of issues over the past decades. From August 21 to 26, the 9th congress of the European Society for Analytic Philosophy at LMU offers a unique opportunity to become better acquainted this wide-ranging subject. It is taking place in Germany for the first time. 700 scholars from all over the world have registered. Initially, analytic philosophers were only interested in linguistic philosophy and the philosophy of science. Today this has fundamentally changed. In the meantime, analytic philosophers “deal with all questions,” according to Stephan Hartmann, an Alexander von Humboldt Professor and Full Professor of philosophy of science at LMU, the organizer of the congress. In addition, there is a tendency in analytic philosophy to examine specific problems very carefully. For example, this is the case in climate science. “Climate change opens up many possible starting points for philosophers. They ask about - purely epistemologically - the foundations of certain complex climate simulations, but also about how they are evaluated and how credible their results could be for the public.” For example, how important is it that climate science presents a unified opinion to the public, particularly when trying to convince the public to take urgent measures? 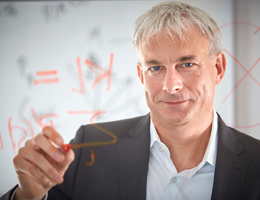 Stephan Hartmann, who is not only a philosopher, but also a physicist, is looking to solve philosophical questions with mathematical methods at the Munich Center for Mathematical Philosophy. In addition, he also works with the psychologist and recipient of the Anneliese Maier Research Award, Ulrike Hahn, from the Birkbeck University of London. She is an expert in the psychology of reasoning, decision-making and judgment, and performs cognitive science experiments. Both the psychologist and the philosopher are interested in individual and collective rationality. The philosophy of neurosciences is also one of the areas "in which a great deal is happening, at LMU, for example, in close collaboration with the Munich Center for NeuroSciences (MCN) and the Graduate School of Systemic Neurosciences (GSN),” says Hartmann. In turn, the topic is strongly represented at the congress. The philosophy of language and the philosophy of science traditionally play an important role in the subject and at the congress. “In the philosophy of science, it is now consensus that one cannot say so much about science in general, because the individual disciplines are so diverse. Philosophies of biology or physics are now dealing with very specific questions arising from the practice of the subjects.” For example, philosophers and physicists work closely together on the foundations of quantum mechanics and quantum information theory. “For instance, they question what the “speedup” of quantum computers explains, and whether quantum mechanical probabilities are objective or subjective.” On the other hand, the question of values and their role in science, for example in the selection of topics and the acceptance of certain questions, is relevant across the board. The second most popular section of the congress is metaphysics, whose representatives are concerned with the foundations of all being. Yet metaphysics meant little to the founders of analytic philosophy in the so-called "Vienna Circle" at the beginning of the last century. “They were averse to metaphysics, even hostile towards it, because their statements were not empirically verifiable. Today the attitude is very different,” according to Hartmann. Several philosophers from the U.S. will also attend the congress. Kwame Anthony Appiah of New York University is one of the outstanding representatives of the subject of social and political philosophy. He will deliver one of the two public evening lectures at the congress, talking about political equality. For female philosophers a Women's Caucus is offered at the congress, in order to foster networking, for example. There is also a Graduate Student Gathering for young scholars. It is intended to provide young researchers with opportunities to get together and create a community at the congress.